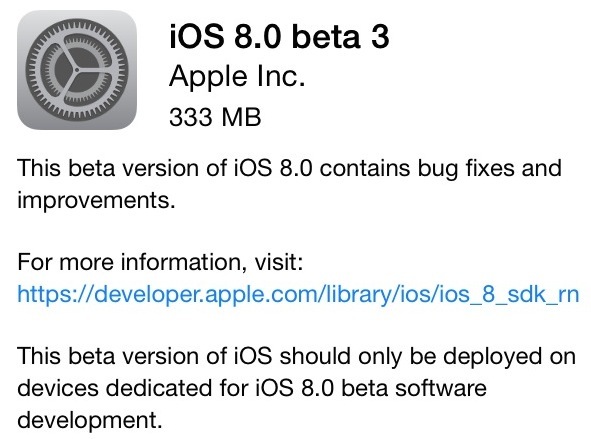 Apple has just released iOS 8 beta 3 for iPhone, iPad and iPod touch and it is now available for download. The update has been released through the dev center and over-the-air for devices that were running previous beta. This release that has a build number of 12A4318c brings several bug fixes and improvements to the beta version of the operating system. There are several changes that have been made to iOS 8 in this release. Here are some of the notable changes that Apple has introduced in beta 3. An on/off toggle for Handoff feature has been added. New wallpapers have been added. Option to upgrade to iCloud Drive has been added. An option for QuickType has been added in Settings. If you are a registered Apple developer then head to the dev center to download beta 3 for your iOS device. Also, if you find any other change in beta 3 let us know in the comments section below.